Hello Monday and hello to something new! I have been thinking about creating a weekly link up for some time. I supposed now is a perfect time to start. I hope you'll join me and link up your handmade projects. Whenever I am not quilting, I like to whip up something small that I can finish quickly. Usually those end up being zippered pouches or a small bag. 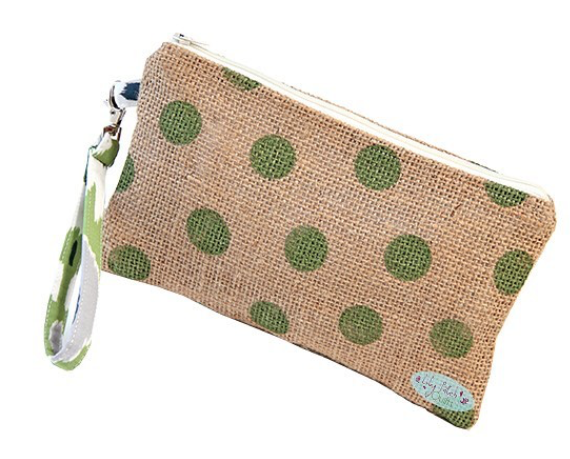 I was wanting to try out some burlap bags and found some of these cute polka dot burlap prints to use. I have to say that it seems like this burlap stretches in every direction. The best thing to do is spray starch the fabric and press with a pressing cloth placed over the burlap to get the burlap stiff enough to work with. I do love zippered pouches to keep things organized but it's always a fun idea to use up scraps and have the option of using the pouch as a wristlet. If you've ever used linen, it sort of has a mind of it's own. Starch is also nice to use on linen to keep the fabric from shifting as you're cutting out your pieces. 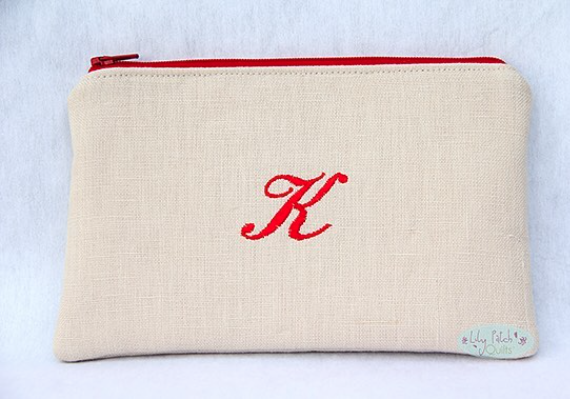 This zippered pouch was the first thing I ever practiced embroidery on. It was a small project so I wasn't too worried about messing it up. The font was already built into the embroidery machine. I am happy to say that I did not mess up and loved how this pouch turned out. What a great idea Kim! I've not been sewing much lately, but I'll be sure to link up when i do get back to it! Cute! Can you tell us where to get the pattern?